We live in difficult and troubling times, facing unprecedented global challenges in the areas of climate change and ecology, finance and economics, hunger and infectious disease, hopelessness, helplessness, loneliness, depression and anxiety, international relations and cooperation, peace and justice, terrorism and war, armaments and unprecedented violence. It is precisely in times like these – unstable and confusing though they may be – that people everywhere need to keep their eyes on the better side of human nature, the side of love and compassion, rather than hatred and injustice; the side of the common good, rather than selfishness, individualism and greed. There is no doubt that the world is in a desperate need of change: A change for the better, a change for the common good. But the big question is: How? What can I do? The answer to my mind is very simple: Kindness, doing good, helping others. In short, volunteer and do it all for the common good. This is why I want to share with you the joy I have received reading a wonderful book, a book I chose as one of my main reading texts for the Business Ethics Course I teach at California Lutheran University. Please get the book, read it. It is life-changing. Believe me, you will not be disappointed. Allan Luks, former executive director of the Institute for the Advancement of Health and executive director of Big Brothers/Big Sisters of New York City, has studied kindness and the clear cause-and -effect relationship between helping and good health. Allan's work, lectures and writing focuses on the difference in society that one person can make and the important role of nonprofit organizations as the public’s conscience. From his roots in the idealism of the ‘60s and ‘70s, he brings to the fore the personal benefits of volunteering, mentoring, and social change leadership. Among his audiences are business trade associations, fraternal organizations, religious groups, alumni associations, retirement groups, and both nonprofits and for-profit corporations with social change agendas. Based on national research that Allan did 20 years ago, he introduced the term “Helper’s High”—the powerful physical feelings people experience when directly helping others—to explain the real benefits to volunteers’ physical and emotional health. Today, this awareness has become internationally recognized as a way to recruit volunteers. 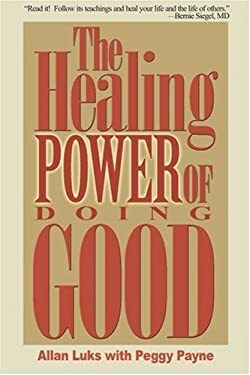 His book: “The Healing Power of Doing Good” explains the relationship between good health and volunteering, and the factors that make it possible to allow individuals to maintain their independence as they grow older and face both physical and mental health challenges. 1. Helping others contributes to the maintenance of good health and can diminish the effect of minor and serious psychological and physical diseases and disorders. 2. The rush of euphoria often referred to as a “helper’s high” after performing a kind act involves physical sensations and the release of the body’s natural painkillers, the endorphins. The initial rush is followed by a longer period of calm and improved emotional well-being. 3. The health benefits and sense of well-being return for hours or even days whenever the helping act is remembered. • Reverses feelings of depression. • Reduces feelings of hostility and isolation that can cause stress, overeating, ulcers, etc. • Decreases the constriction in the lungs that leads to asthma attacks. 5. Helping can enhance feelings of joyfulness, emotional resilience, and vigour, and can reduce the unhealthy sense of isolation. 6. The awareness and intensity of physical pain can decrease. 7. Attitudes such as chronic hostility that negatively arouse and damage the body are reduced. 8. A sense of self-worth, greater happiness, and optimism is increased, and feelings of helplessness and depression decrease. 9. When we establish an “affiliative connection” with someone (a relationship of friendship, love, or some sort of positive bonding), we feel emotions that can strengthen the immune system. 10. Caring for strangers leads to immense immune and healing benefits. 11. Regular club attendance, volunteering, entertaining, or faith group attendance is the happiness equivalent of getting a college degree, or more than doubling your income.